Today’s cloud is becoming the basis for cost-effective communications, supporting a wide variety of services that help your teams collaborate more effectively. 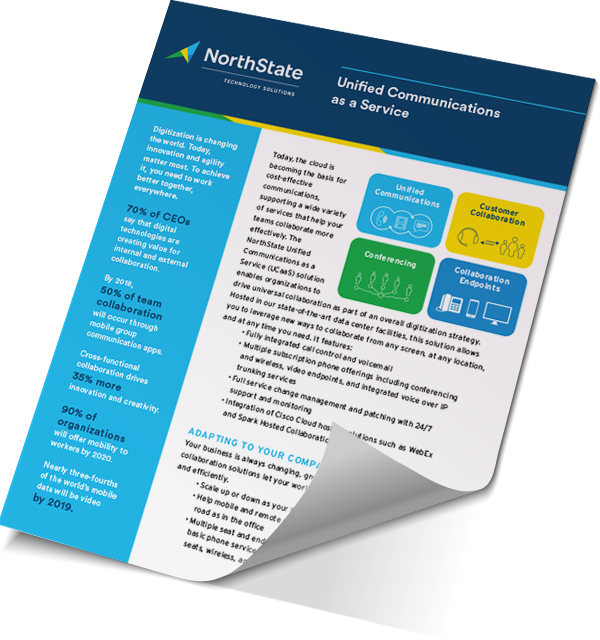 The NorthState Unified Communications as a Service (UCaaS) solution enables organizations to drive universal collaboration as part of an overall digitization strategy. Hosted in our state-of-the-art data center facilities, this solution allows you to leverage new ways to collaborate from any screen, at any location, and at any time you need. Your business is always changing, growing, and expanding. Our hosted collaboration solutions let your workers communicate more effectively and efficiently. Hosted collaboration allows IT teams to focus on the demands of managing in-house collaboration technology. For many companies, hosted collaboration is a money-saving capability that securely integrates with your existing network. Based on a single-host dedicated IaaS (infrastructure as a service), this solution is suitable for small environments or for testing, development, and recovery. Management, maintenance, administration and monitoring of Cisco Unified Communications Manager, Unity, Voice Gateways, and associated voice solutions.